SOUTH BURLINGTON – For years now, despite strong local opposition to the plan, the Air Force has claimed that there is no other mission for the Vermont Air National Guard besides the basing of the F-35 stealth fighter jets. But with the overwhelming numbers of residents voting against the plan, the Air Force has put forth some alternative missions that could keep the base open once the F-16s age out of their useful mission life. In a memo leaked anonymously to The Winooski, three potential missions were outlined. Telemarketing. One option for the base is to have officers call Vermonters and attempt to sell government bonds, old jet parts, and other items as yet to be determined. Again, this would not be as obnoxious as the original mission, or the surprise attacks on Chittenden County residents, but would be a very close third. There is reported interested from both LuLaRoe and Rodan + Fields to explore a partnership with the base should this mission be chosen. Running for office. The third idea, which is admittedly a stretch and a very long game to play, would have soldiers settle down, find other jobs, run for political office, and eventually take over the area’s local government and vote to re-instate the F-35 mission. Becoming politicians, while fairly annoying, would be far less offensive than attempting to sell MLM products, assaulting random strangers, or damaging entire schools and neighborhoods, but if it worked it could eventually mean the successful completion of all other missions. A detailed plan was put forth, lining soldiers up with different government offices to run for. The only job not in danger of being subsumed by the Vermont Air Guard was mayor of Burlington, as that position has already been infiltrated. 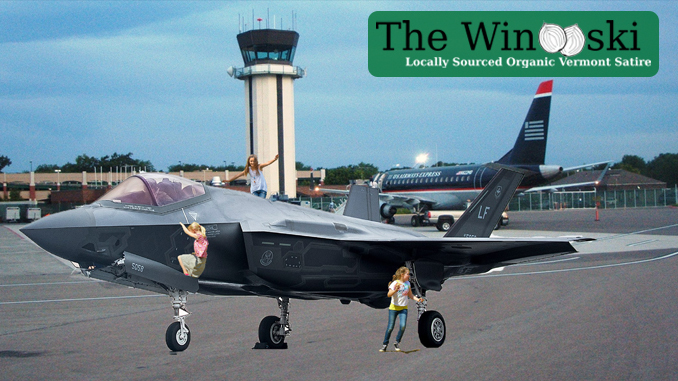 The Vermont Guard will no longer continue using the “no other mission” argument, and instead will focus on convincing residents that the F-35s will be “fun for kids to play on” and “it’s not child abuse if the government does it.” But if the planes are indeed successfully re-routed, there are at least a few fallback plans for the Guard to keep the base open indefinitely.